Two or three years ago, on this very blog there would be a steady stream of girl phones. You know what I mean: pink, dimante-encrusted things that would come pre-loaded with girl-friendly ringtones ‘Oops I Did Again’ and would perhaps match with your make-up case and maybe have a mirror on the back so you could check the eyeliner dear. While these phones have their place in the hearts of many girls and surely some boys, they seem to have died a death. While the odd pink-shelled lovely does swim our way, there are definitely fewer around. So what’s changed? We’re saying they’ve been killed. Handsets are always getting murdered in the world of technology journalism (iPhone killer! Blackberry killer! iPhone killer again!) but this time there is a corpse on the carpet and the clues point firmly towards the smooth black inscrutable iPhone. That dark horse. Previously the simplest way to get an individual or different phone was to buy one that looked a bit different, whether it was pink, purple or just had an anime kitten on it. They all texted and sent calls so that was standard. iPhones have changed the game because it switched the customisation from the outside of the phone to the inside, from the hardware to the software: you don’t need to put stickers on your phone to customise it, you can download some of those those highly successful little software packages called apps and hey presto there’s a newsfeed from your favourite paper, a DJing app and 400 pictures of Robert Pattinson (if you want that). Add in all the standard smartphone extras – your music, your photos and phones are very personalised devices. 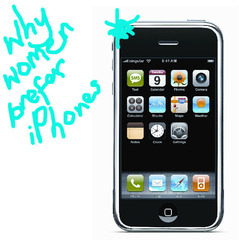 Other reasons women prefer iPhones? okay, Gender Stereotype Alert No.2, I think girls like tech for what it can do rather than treating it as status objects. They are less likely to reel off lists of specs and engage in my RAM is bigger than yours competitions. They just want to know what they can do with it. Back to the app store and it’s evident that apps let you do stuff. It’s all pure function. Hardened geek heads may not be proud to admit that they have iFarm and iDoodle2Lite on their phones, but silly or not, apps multiply many times what you can do with your phone. I like it. I’m just saying, I think women generally like it too. And let’s just add that girls like smooth touchscreens, fast processors, decent cameras and games where you can flick pygmies off islands (well, I like them) and it makes sense that the sleek iPhone has cleared the board of glittery competitors. Thanks for the information in this blog. Very great post. This is adorable. Keep on posting. Girls usually go for coloured, handy and stylish phones. They wont be specific in the features. usually girls don’t for touch phones rather its a symbol of status. Agree with you because girls always want different stuff and iPhone has the best graphics and customization with various iPhone applications….Thanks for sharing your thoughts. Hey man this is really a nice post i like it very much…. I agree girls like to customize their stuff. iPhone has the best graphics and customization with various iPhone applications. Well that is really true Iphone has now overcome the all the other phones like Nokia ,BlackBerry etc. With this new development in technology of Iphone, Girls phones mean in specific colors etc are vanishing. Technology is growing so are the human needs.. so changes are to be accepted. I think Michalyn missed the point of the article. Before the iphone, customization was limited to the outside of your phone. Now that we have the iphone, we don’t need the extra “doodads” on the outside to express ourselves as individuals. Regards. If customization were the gender key, then Android would skew higher with women than the iPhone. And… it doesn’t. At least according to recent demographics pasted all over the tech blogs. iPhones have probably contributed to killing the “girl phones” because they are marketed with cute guy Justin Long (now a romantic comedy movie star) and the ads aren’t gender specific and annoying. But we’ll see — Droid is skewed towards men in their ads and the Palm Pre on Verizon is skewed towards women. Years ago while talking phones with a carrier rep, I was told that flip phones are “guy phones” because guys put their phones in their pockets and so protecting the buttons and a smaller form factor are important to guys. “Girl phones” typically weren’t (according to the rep) because women stuff their phones in purses and so protecting the keys isn’t so important. Maybe touch screen phones are unisex because once you lock them, there are no buttons to worry about? …Sometimes, I find myself wishing my iPhone had a place to dangle my phone charms off.